Discussion in 'Flower Gardening' started by Tooty2shoes, Jul 2, 2013. Well do not tell my Iris's that they can't change color all on their own. I have been documenting a dwarf dark lavender Iris since 2006 that has been changing to a light creamy beige yellow. I had even contacted Schreiner's Iris's to see what they would have to say as to why it is doing the color change. They said that Iris's do not do that. Well don't tell this one it isn't possible. The blossoms start out as bi-colored as you can see from the first pic. Then the following year they turn the creamy color. One master gardener I talked to said that maybe they where reverting back to their original stock color. I have no clue. But I sure am enjoying watching the neat color show. I just wish they would stay bi-colored. This year I had five blossoms the light color and just the one Bi-colored. Next year should be interesting to see what happens. Frank, stratsmom, Henry Johnson and 6 others like this. Thanks everyone. Yes that mother nature sure has some surprises up her sleeve. Wow Tooty! Very unusual! Thanks so much for showing this to us. 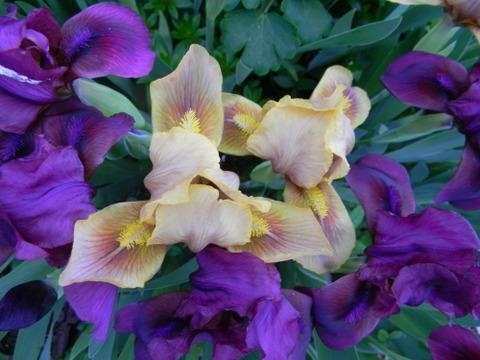 I just googled "Iris changing color" and you are right, all the "experts" say this cannot happen! Only one source suggested two possibilities: do you know if your iris could have set seed? Maybe the baby iris do not breed true to color. Cayuga I found the same answers as to why it could not do that. But I wonder about the second you listed. Could very well be the reason. I do not keep them from going to seed so it could be. But to come out Bi-colored the first year and then change over to the lighter color still is a mystery to me. Toots--I have had some daylilies bloom their first year a paler version of their final color. Of course that is different than a bicolor....I agree it is a mystery! Iris can Do that! It is a gene goof up. There is a discussion on Face boos Iris lovers about this very thing. The prettiest ones I've ever seen! I have had irises change color from one year to the next. A lot of old timers around here claim they do that. 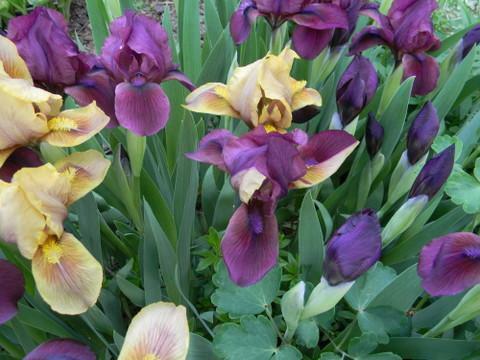 I just thought that I had so many irises that I was forgetful of what colors they are. My one rose of sharon bush seems to change colors too. Some years it is LAVENDER, and others it is PINK. This year that bush is PINK. I need to get a new picture, and compare it with old pictures of it. I just thought my eyes were goofy or something. Maybe my bush is goofy. Yes all our plants can do amazing things. Often very beautiful things. TPL- I did check out the group at facebook and joined. Now I can see what they think about the bi-color iris blossoms. AA-I know some of the color change in other flowers can come from minerals in the soil. But it sure is fun to see. Hydrangeas change color with soil acidity or akalinity, so why not other bushes or plants ? They even sell stuff to make them pink or blue. Yes so true. So why not. Funny that Schreiners Iris said that an Iris can not do what mine are doing. Go figure. Enjoy the beautiful change, I hope you really like the new color.